Square Red mark of Oriental Looking Letters:- I acquired this piece from an estate sale of an antique dealer that had been boxed up for 30+ years. There was a good mix of china, glassware, and other items from many ages. Most of it, I would guess, dated early to mid-twentieth century, with about 1/4 to 1/3 dating earlier. 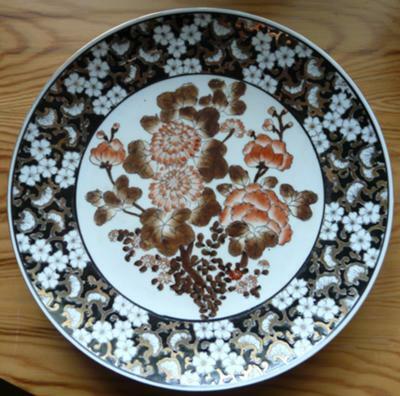 It is a decorative plate, 10" in diameter. The design appears to be over-the-glaze with hand-painted coloring that accents what looks like a stamped base pattern. The black in the outer band appears to be a thicker lacquer paint. There is no crazing to the glaze, but the resting edge on the bottom has definitely seen some shelf wear. The hallmark is over-the-glaze. The hallmark reminds me of some Japanese porcelain stamps; however, the characters do not fit the Japanese alphabet. The structure of the characters also remind me of Russian characters; however, not well enough to keep me pointed in that direction. My guess is that this piece dates to somewhere in the 20th century; however, this is a wide guess. OK, look out for the comments section below. I am planning to write up a series of replies for this hot topic of red seal marks. Have you, by any chance scrolled through the marks on Gotheborg.com to see if this mark is there? If not, could you do so please. Then, I would like to put your pics on your above post (I have to do this manually). Send the pics to me or upload on a submission form. If you need more help on that, just shout. 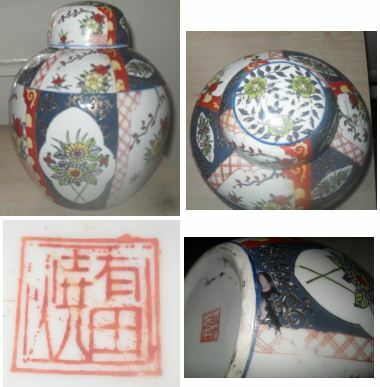 I have found the mark Seal reading Arita-yaki - , the left being a single character, early to mid 20th century.but i have not found any vases with the same flowery pattern yet it seems to have a lot of gold leaf and honey comp pattern all around it i will try to send you a picture or 2. Thanks for that info Andy and thanks for the photos of your vase. I understand, although I am no expert in Japanese wares that Arita-yaki is a word which in the West is called Imari ware after the port it is shipped from in the area of Saga. The actual town of production is Arita which is with an area which used to be known as Hizen Provence. 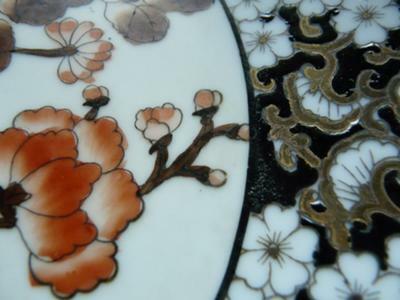 I would never have recognised your vase as Japanese Imari - the flowers and colours look like Chinese Famille Rose. But there you have the non-experts dilemma. Japanese pottery sometimes impersonates Chinese wares, but not usually the other way around as far as I can see. 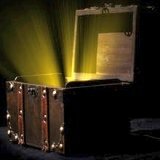 In terms of value, don't really do valuations in this section - I tend to send the queries off to experts because this area is somewhat of a minefield and beyond my scope. And frankly, I can't see any obvious difference. Beats me. It would be great to get someone who knows this area submit a contribution here. Before posting my original question, I had visited this website, but I did not find this mark. 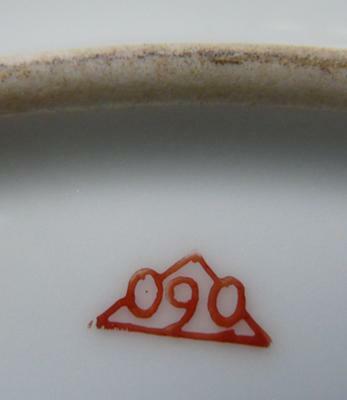 I too looked on Gotheborg.com to see if I could see this seal mark attributed to Arita-yaki Imari wares. I could not find this reference either - however, it is a big and slightly disorganised site, so I may have missed it. Andy could you please give us a URL page address so we can go look for ourselves. “Da Qing Qianlong Nian Zhi” which translates as - "Great Qing Qianlong Period Make". The Qing dynasty ruled in China from 1736-1795, so that contradicts Andy's find on Gotheborg. 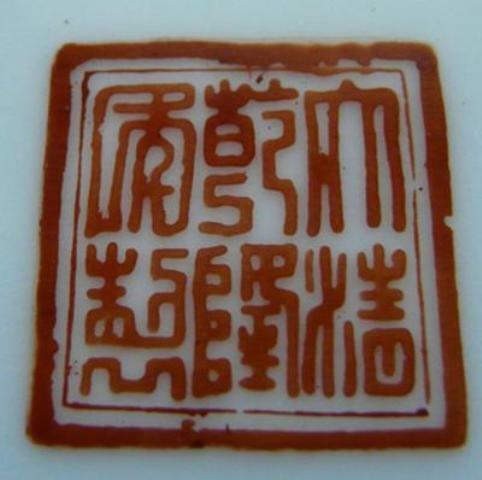 According to the expert, there were many style pieces of this type reproduced in the 20th Century - the Qianlong seal being used as a tribute to that great age of porcelain production. Again looks Chinese to me rather than Japanese, and the red seal mark is very typical of the 20th Century Chinese red seal marks. But remember, I am no expert, and this is why this area of ceramic identification is so much a can of worms, because on closer research I looked at the Gotheborg site again and found the mark you were referring to. Your mark is indeed saying "Arita-yaki" but the style of the seal is in the Chinese Qing Dynasty red ink stamp of the 18th Century. Talking of experts, I know where to find them, if you ever need one (and I have them well trained! ;-)). Just shout. i have exactly the same vase with same red mark and the flowers. 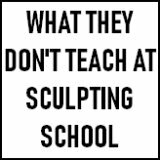 have you found out any further information about it. 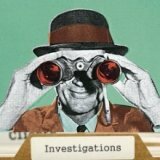 i believe its early to mid 20th century. i would be very interested in any further information. is it japanese or chinese?